Normally a bunch of teenagers squabbling in school wouldn’t be my idea of a good show, but this is Saved By The Bell! 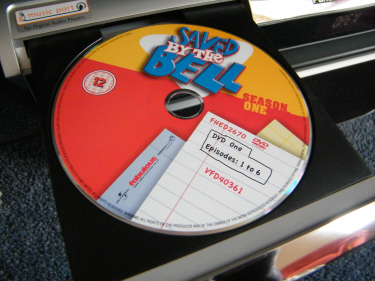 The classic American teen sitcom has now been released in the UK on DVD, over 20 years after it was first aired. If we hadn’t been asked a question at the end of class when I was at school we used to say “yes! saved by the bell”, just the phrase brings back memories as I’m sure it does for thousands of other people. The opening of Episode 1 on the DVD begins with everyone dancing in the school restaurant (as you do) and upon the news of a dance contest Slater shows his moves to impress Kelly, complete with cheesy background music of course. Just this corny opening puts a big grin on my face like a kid again! On the topic of cheesy music; at the start of every episode, be prepared to sing-a-long to the theme tune, it becomes almost addictive. ‘Bayside High School’ is where it all happens, mainly in the communal locker areas as well as the classrooms and restaurant. Antics, problems, detention, fun times and bad times all happen within the school. Although the set itself is nothing exciting the dress sense of the early 90’s is fantastically awful! The general same themes run through every episode, Zach and Slater competing against each other, normally for the affection of Kelly. As well as Zach getting in trouble, Lisa’s gossiping, Jessie being smart and Mr Belding’s wackyness. But amongst it all the real star of the show is Screech! The vulnerable science geek who has all the best lines and funny moments. One slight gripe I have with the DVD is that episodes are ordered in ‘air date’ and not ‘production order’, so the proper first episode when Zack meets Slater is actually the second to last one you watch. Somewhat annoying, however the episodes don’t really flow into each other so it isn’t a major issue. But be aware otherwise it can throw you off a bit when watching. There is also no real extras available, once again not a big problem but a shame nonetheless. The show is riddled with poor acting, naff jokes and cheesy storylines. But funnily enough this is what makes the show what it is, and it has an honest feeling about the program. Maybe a big part of it’s appeal is bringing back memories, but whatever it is it still has a touch of magic and I enjoyed every minute of watching it. Overall I give it 8/10, if you want to buy a DVD to watch which is something different compared to the latest sitcoms this is the one!